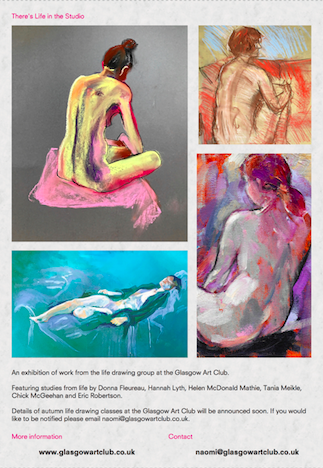 An exhibition of work from the life drawing group at the Glasgow Art Club. This exhibition allows us to look behind (normally) closed doors, exploring the soft intricacies of the human form. Featuring studies from life by Donna Fleureau, Hannah Lyth, Helen McDonald Mathie, Tania Meikle, Chick McGeehan and Eric Robertson. The Glasgow Art Club hold life drawing sessions for both members of the club and members of the public. 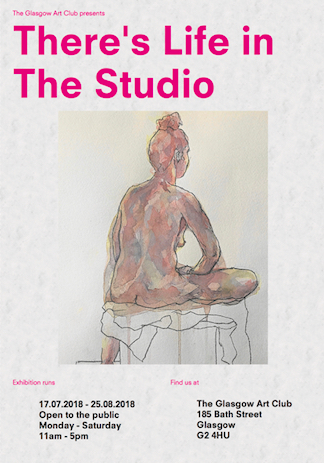 There’s Life in the Studio is a celebration of the diverse and creative work produced during these sessions. Visitors can expect to see a great diversity of techniques and approaches, demonstrating individual technique and artistic expression. Life drawing has traditionally been the cornerstone of any art training. For beginners to accomplished artists, the sessions at GAC provide an opportunity to learn or practice the essential skills of observation drawing. The human figure offers every challenge – line, shape, tone, colour, perspective and composition. Details of autumn life drawing sessions at the Glasgow Art Club will be announced soon. If you would like to be notified please email naomi@glasgowartclub.co.uk.